Program Description: National American University's MBA program provides students with a global perspective of the business environment while helping them to explore topics of regional relevance. Course topics include leading the organization, information technology for strategic advantage, managing marketing programs, and analysis skills for managerial decision-making. The personal interaction with faculty and other students is what makes our graduate program so unique. You'll "attend class" weekly, on-line, at your own convenience for threaded discussions with your classmates, assignments, and review. Once a week, you'll have live Internet sessions where you and your classmates can speak to your professor and each other in synchronous discussion (real time, live audio) over the Internet. Three times during the course of the term you will participate in facilitated sessions at a National American University regional campus, or live online facilitated sessions. Accreditation: National American University is accredited by the Higher Learning Commission and a member of the North Central Association. 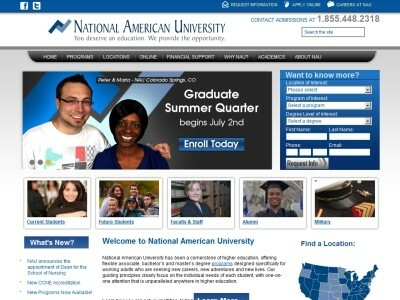 Location & access map for "National American University"